Singapore's 'In' crowd had a blast as it witnessed the Exclusive Launch of Wendi Koh's 'Gutsy Girl' at the Heeren HMV 19th October 2002. Wendi was in top form and having great fun at The Atrium stage, and later sat down to a spontaneous autograph session. She officially launched 'Gutsy Girl' at the Outdoor Amphitheatre at the Esplanade on the 15th of November 2002. Set against the beautiful backdrop the Merlion and the sea, backed by talented musicians and singers, she blew the audience away with her vocals and powerful stage presence. You can EMAIL FOR CD INFO/ORDERS now! 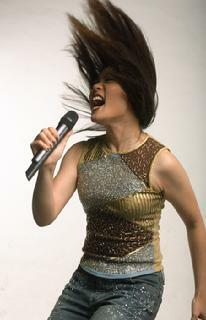 Wendi Koh is one of Singapore’s most dynamic, sought-after female entertainers. Her signature: Powerhouse vocals coupled with an incredible stage presence. Welcome to Wendi Koh's Official Website!